In summary: Bitcoin is currently technically limited (number of transactions / second, transaction costs ...). The Lightning Network is the name of a technology to correct these limitations. 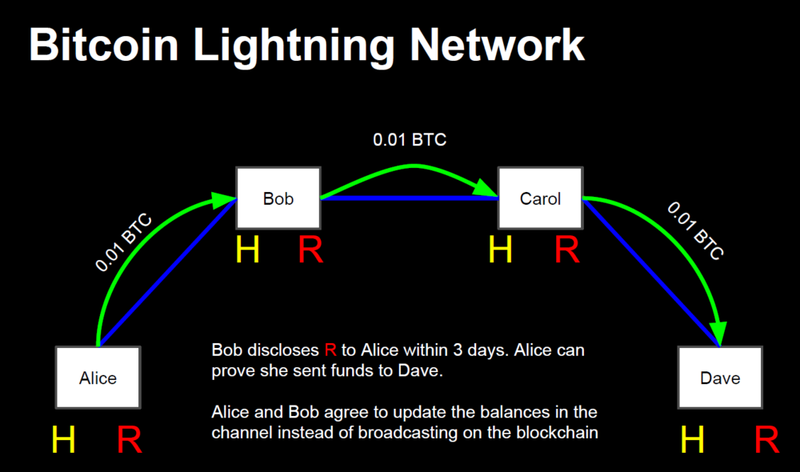 The Lightning Network takes the form of an off-line network that supports the main Bitcoin network. The notion of layer is a decisive aspect in understanding the architecture of blockchains. A layer is a protocol that relies directly on a blockchain to improve its characteristics or offer additional features. We will take the example of Bitcoin with the Layer Lightning Network, which addresses the need to improve network scalability in order to enable microtransactions at a lower cost and to reduce payment confirmation times. - The network is not able to absorb more than 7 transactions / second. - Transaction fees can be up to several dollars for a single payment, preventing any micro-transaction. - Several minutes or even hours are required to confirm a payment (1 block mined every 10 min). Lightning Network, how does it work? The main utility of the Lightning network is the opening of improved payment channels. Unlike the distributed Bitcoin protocol registry where transactions are unidirectional , the Lightning overlay introduces bidirectional channels, allows the implementation of conditional payments and his algorithms ensure instant secure exchanges at no cost. - An opening transaction or funding transaction. - A closing transaction or closing transaction. The funding transaction can of course be shared between the two users (Paul and Luc deposit for example both 5 BTC). Funds are frozen in a secure, multi-signature common address. Unlike the traditional Bitcoin blockchain protocol where donations are possible (you do not have to be active to receive a payment), using the Lightning Network requires commitment from both parties. The transaction channel opens only when the funding transaction is confirmed on the Blockchain. The closing transaction can be triggered bilaterally or laterally under certain conditions . The users thus exchange freely within a private register, shared between them only. The total balance can not exceed the sum initially blocked on the common address. How does Lightning create trust and allow it to securely trade on the payment channel? The system is based on the HTLC (Hash TimeLock Contract) protocol that we will not detail here. To summarize, this is a transaction scheme where the receiver must prove in a given time that he has received the payment. Without an answer from him, the sum is automatically returned to the sender. To learn more, you can read this excellent article detailing the operation of the protocol. Lightning includes in its code the development of commit transactions. Commit transactions are security in the event of a conflict or if one of the users becomes unresponsive. As payments are made in the channel, users exchange their private signature keys. This allows everyone to publish the closing transaction on the Blockchain to close the channel at any time. This fundamental function makes it possible to be refunded the amount of its funding transaction (or its balance at a time -t) if the other user disappears. Reminder: the common Bitcoin address where funds are frozen requires the private keys of both parties to be unlocked (multi-signature). Finally, the Lightning protocol provides an immediate penalty if one of the users tries to cheat (payment of a sum he does not have). His funds are lost. The network automatically determines the fastest path. What about anonymity? Lightning relies on the Sphinx protocol to encrypt exchanges . Lightning is above all a decentralized peer-to-peer payment network. This means that its protocol opens the possibility of carrying out transactions via payment channels between users. This feature eliminates the need to create a dedicated channel for each interaction. Example: Paul wants to send 5 BTC to Alice. Paul does not have an open channel with Alice. However, a channel is already open with Luc, and Luc has an open channel with Alice. The development of new blockchains on which many projects are based highlights, over time, the need to build bridges between the different networks. We can imagine communication protocols allowing the exchange of information between the different distributed registers. This aspect is particularly consistent with the notion of layer, where, in the case of Bitcoin for example, the Lightning Network includes software foundations for connection with other blockchains. There are many other layers, such as Rootstock whose promise is to be able to establish secure smart contracts anchored on the Bitcoin blockchain. The off-channel channels are not only intended to contain transactions between users, but can ensure the implementation of smart contracts and other applications. The possibilities are endless. An official release date for the Lightning Network hasn't come out as of yet. Various rumors indicate that mid of 2018 we will have an official launch and a possible implementation in the Bitcoin Network .